All eyes were on London over the weekend with Diamond League and IPC Athletics Grand Prix Final action at the Sainsbury’s Anniversary Games but there were some notable performances elsewhere. USA won the most gold medals with 13 but hosts Canada won 11. Cuba’s Yarisley Silva won the women’s pole vault in a world-leading 4.85m. Andre De Grasse won the sprint double, with his 19.88 Canadian record just pipping Rasheeed Dwyer and Alonso Edwards’ 19.90. Canada also won the decathlon through Damian Warner’s national record 8659 points while Derek Drouin won the high jump with 2.37m and Christabel Nettey jumped 6.90m in the long jump. Jamaican O’Dayne Richards set an area record in the shot with 21.69m. Luguelin Santos won the 400m in 44.56 as four athletes broke 45 seconds. American David Oliver won the 110m hurdles in 13.07 and Cuban Pedro Pablo Pichardo won the triple jump with a windy 17.54m. Jamaica’s Sherone Simpson won the 100m in 10.95 while Colombia’s Caterine Ibarguen won the triple jump with a windy 15.08m which otherwise would have been a world lead. Over 800 athletes competed at the British Masters Championships, many in preparation for the World Masters Championships in Lyon which starts next week. 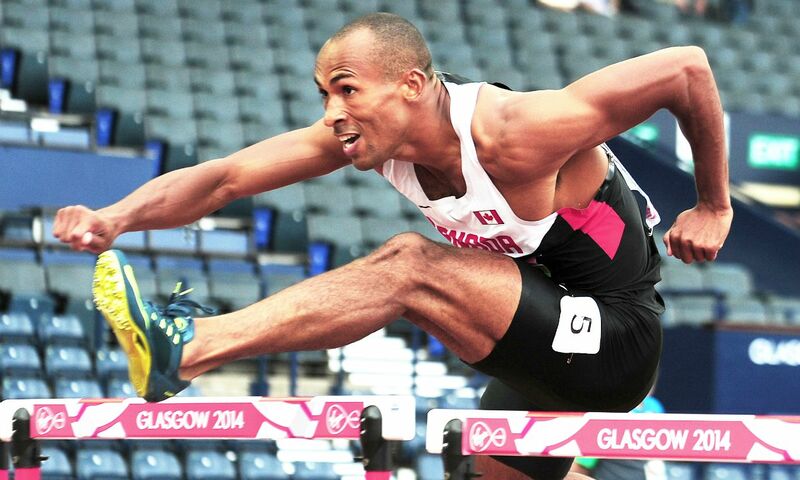 Charles Eugster improved his British over-95 200m record to 57.27 and set a British best of 23.78 in the 100m. There were British records for 1956 Olympic steeplechaser Eric Shirley at 200m (42.85) and 400m (98.68). Kathleen Stewart set a British W75 record in the 400m of 87.52. Angela Copson was outside her W65 British record in the 1500m though her 5:34.91 world age-68 best in age -graded terms was a much better performance and scored significantly higher than Genezebe Dibaba’s world record! Jarryd Dunn clocked 45.89 and Andrew Steele 46.18 to win the two 400m races. Andy Vernon was fourth in the 3000m, clocking 7:51.13. Luke Cutts won the pole vault with 5.30m. Jamaica’s Yohan Blake won the 100m in 10.12. Sarah Holt went second all-time in the UK hammer rankings when she won with a throw of 68.97m. Nick Miller’s UK hammer record was the noteworthy British performance though also of note was Lennie Waite winning the steeplechase in 9:40.39 to take five seconds off her PB and achieve a World Championships qualifier and go fifth all-time in the UK lists. You can read more about Miller’s British record here. Chris Clarke won the 200m in 20.59. ESAA 800m champion Joseph O’Hara achieved his first sub 1:50 clocking when he won in 1:49.91. European under-23 800m finalist Katie Snowden set a PB of 4:14.73 in the 1500m. W40 Kim Fawke won the women’s race in 35:17.